I missed my gardening therapy this summer. For the first time in many years my back lot went gardenless; mostly due to the heat, but also because my life suddenly took a turn toward busy as I began researching museum archives and the memories of locals in order to write a history book. 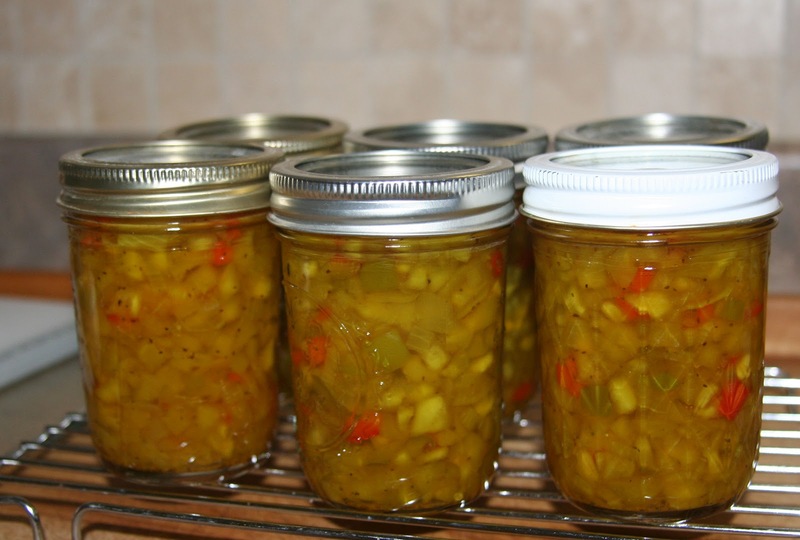 Wouldn’t you know then, that this is the year I ran out of my stored jars of dill pickles and sweet pickle relish? 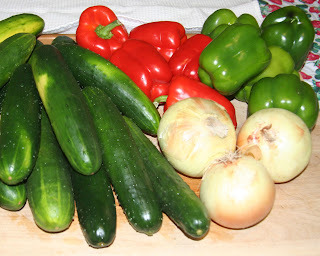 That left me begging area gardeners for cucumbers, small for the dill pickles and large for the relish, plus bell peppers and onions. My dill volunteers itself each year, so I had plenty of that. Luckily, one of the best gardeners in our area, a woman named Cindy, fed my veggie desire. 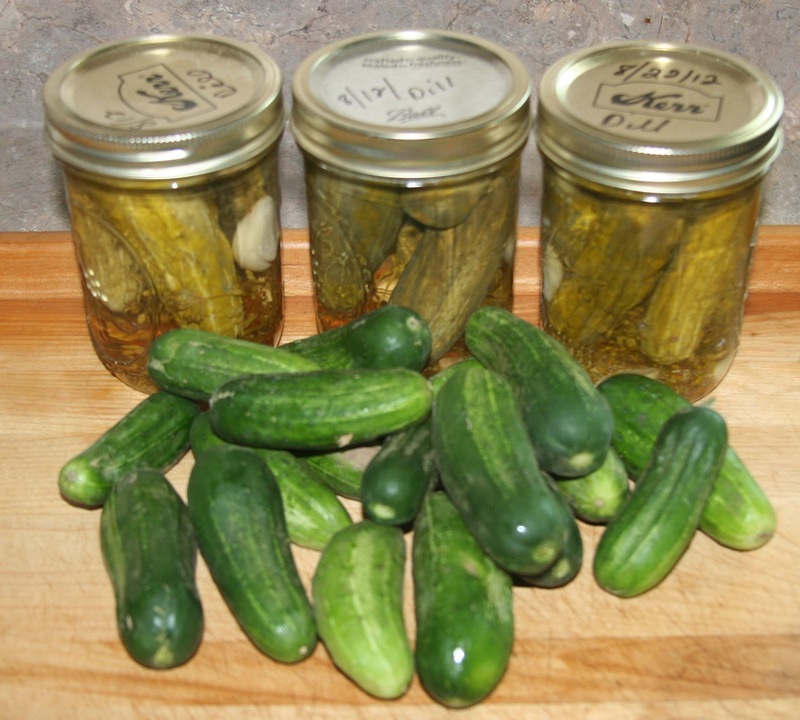 Normally when I grow my own cucumber vines, I pick the small cukes as they come on and make a jar or two of dill pickles at a time as I pick them. This requires making the brine ahead of time and storing it in the refrigerator. The brine consists of two quarts of water, one quart of cider vinegar and one cup of canning salt. Some people use white vinegar, but I prefer the taste of the cider. Do not use regular salt in place of the canning salt unless you want shriveled, dark pickles. Heat the brine long enough to dissolve the salt unless you are making pickles right away. In that case, bring it to a hard boil. While the brine is coming to a boil, place heads of dill, one for a pint, two for a quart into the bottom of sterilized canning jars. Add cleaned garlic cloves, two in each pint and four if using quart jars unless you like less garlic taste. In that case, cut the number of cloves in half. Then sprinkle red pepper flakes, ¼ to ½ teaspoon depending on your preference for heat, into each jar. 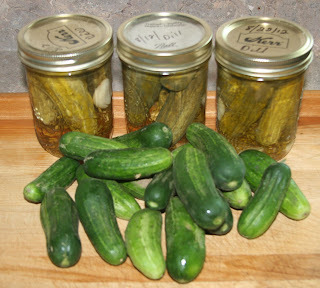 Pack the jars with scrubbed unpeeled cucumbers measuring 3-4 inches each. Fill the jars with the boiling brine, use new, clean sterilized lids to cap the jars and place them in a water bath for 10 minutes for pints, 20 minutes for quarts. If I am canning one or two jars, I use any covered pan with enough depth to cover the jars. I have an asparagus cooker that works great since the insert also keeps the jars off the bottom of the pan. Now comes the warning. If you have no experience in canning, find your local Extension service or buy a canning book and read the rules. I sterilize everything, the jars, the lids, the rag to wipe the jar lip. Processing time starts when the water comes to a boil. Many things come into play, so take no chances. Get the facts from a reliable source, not this blog or any other blog that does not have certification in food safety. With the dill pickle shortage now taken care of, I turned to relish. 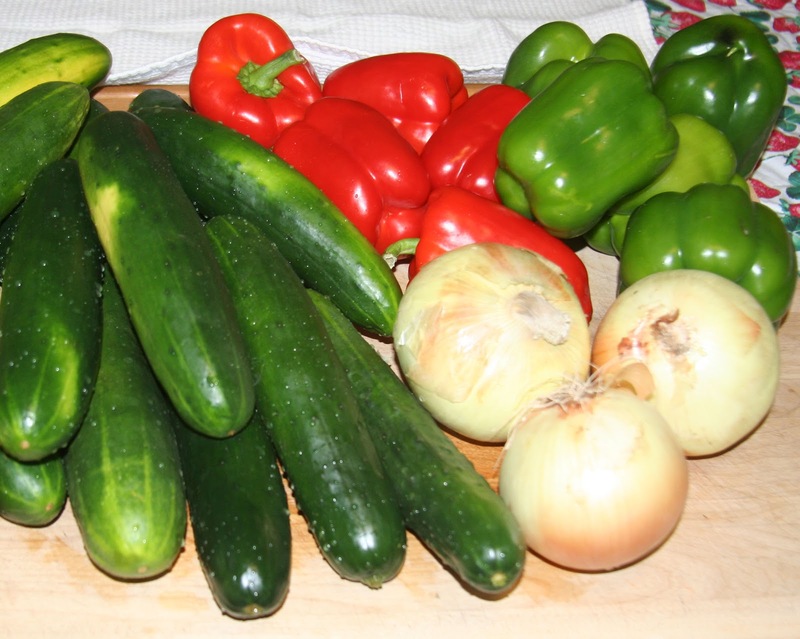 This requires dicing 12 cups of cucumbers, and seven cups of peppers and onions per batch. A friend once asked me why I did not just place chucks of vegetables in the blender with water and chop that way. I suppose I could, but the pieces would not be as pretty, and I would also miss all of the free therapy that I get from dicing vegetables by hand. Maybe I have some repressed anger toward cucumbers. Who knows? I just turn on some tunes and chop away. The end comes almost too soon. My gardener friend managed to bring me enough cucumbers to make around 10 pints of dill pickles plus two batches of relish, which amounts to around 20 pints. Plenty to get me through the long winter until next summer when hopefully I will get in some good gardening therapy. My cousin Karen gave me the following pickle-relish recipe years ago and I have been making it ever since with only minor changes. I use it on hot dogs, hamburgers and in potato salad, tuna salad and egg salad. It has the sweet, salty taste of bread-and-butter pickles. The original recipe calls for either cucumbers or zucchini. I have never made it with zucchini, but I did grow a lemon cucumber plant one year that produced an ungodly number of little round yellow cukes. Those worked fine, so maybe some year when I have a zucchini plant acting in the same manner that yellow cucumber did, which come to think of it is normal for a zucchini plant, I might try it. Water bath canner with insert, mine is the half-sized used for pints. Two heavy kitchen towels, one for holding hot jars another for tightening lids. A good canning book or instructions from your local Extension Service. 1. Place diced vegetables in a 5-8 quart enamel-coated stockpot. Sprinkle with the salt, mix, cover and allow to set overnight. 2. The next morning, pour the vegetables into a colander, wash with cold water and drain while bringing the remaining ingredients to a boil. 3. Bring vinegar, sugar, seasonings and cornstarch to a boil in the stockpot. Add drained vegetables, return to a simmer and cook 20 minutes, stirring occasionally. 4. Fill sterilized jars to within ¼-inch from the top with vegetables and juice. Secure lids but do not tighten. Place filled, capped jars into the insert rack of a water bath canner filled with enough boiling water to cover jars. 6. Remove the jars from the canner using the jar lifter. Using kitchen towels, turn lids to tighten then place jars on a rack to cool. You should hear a popping sound as each jar seals. If a jar does not seal, store in the refrigerator. You should be selling this lovely stuff. Your fortune would be made. Santa has it on her list. Thanks for the testimonial.